Hi! 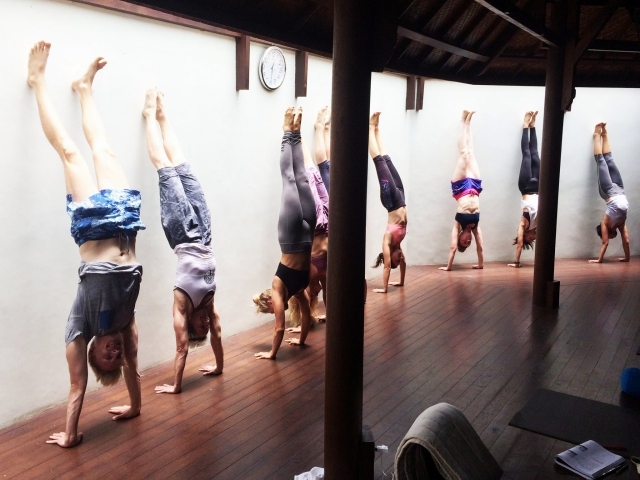 I'm Alina and this is week 2 of my 4-week yoga teacher training in Bali with Routes of Yoga. Join me as I share with you the amazing things I learned from Daphne and Anton in part 2 of my yoga teacher training diary series! Week 2 was such an eye opener for me on chakras, chanting, finding my yoga voice, and so much more. I've never really made a real connection to chakras and energy channels. When I articulated my problem, Daphne suggested to: first, accept the facts and second, take what works for me now. For example, if I can't relate yet or identify with the chakra colors, then the locations in the body might work. A couple of days later on our rest day, we climbed up Mount Batur. From the summit, we watched the sunrise and it was there that I finally "got" it! The colors spread out in the sky, the spectrum of hues of sunrise equals the colors of the Chakras. It is the concept of nature's pattern, of energies. It all made sense! 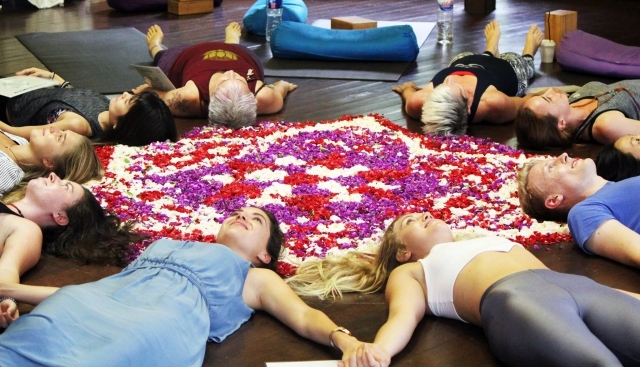 We also learned and chanted the Bija Mantras (the sounds of the Chakras: ”Lam, Vam, Ram, Yam, Ham, Om”), first in a seated position, then we slowly lie down with our heads towards the center, forming a circle. Repetition really does help access a meditative state! All in all, it was a very intense yet equally rewarding experience — phew! Finally, our first Teaching Lab! Oh wow. I totally didn’t feel ready for it yet, but you know what they say — if you always wait 'til you're 100% ready, you'll never get around to doing anything! Our first task is to verbally guide our group of 3 through a set of 3 asanas. No demonstration of the poses, no movements...only guiding them using our voice and clear verbal cues. Afterwards, we have a quick feedback round. I write down most of my cues and am getting really nervous. But I quickly realized the same is true for everyone else, so I just try to focus on the yoga room as our 'safe space'. This is where we are free to give constructive feedback, ask questions, appreciate and respect each other, and experience yoga together. A beautiful concept! I also learned the best way to calm your nerves before teaching a class: practice meditation or pranayama and set a nice, focused energy in the room. Try it! The first feedback really surprised me. They said I have a very nice and calm voice. Wow, ME?! I never realized that, so hearing feedback from others was super helpful. And I'm thankful that this yoga teacher training is helping me find and develop my "yoga voice." Asana Workshop: It's All About Balance! Balancing poses are the focus of our Asana Workshop today. It's a really fun session as Anton also let us try more advanced poses! I realized I really have to learn and develop mirroring skills when teaching and how to demonstrate a pose without writing down cues. Note to self: Challenge yourself every damn day! This is how Anton showed us how important breathing is: we take 10 quick, forced breaths (almost like you're hyperventilating) and you feel it very strongly in your head and body, like a slight dizziness. It is very powerful and can be very dangerous when used without knowledge and caution. Then we compare that with the experience of taking 10 very deep, steady breaths where you instantly feel the calming effect on body and mind. All this to show just how important AND strong the breath can be. Tip: Integrate Pranayama in your daily routine — seriously! Today we talked about connecting with your true self. Anton describes this feeling of connection as having glimpses and moments of true inner peace, and it starts with being fully present, being in the NOW. This got me thinking about how I need to find more positivity in my life, and that starts with my thoughts. I've been staying in our Shala for nearly a week, surrounded by amazing people. And while I love the nice community we have, I felt I needed some alone time to digest and really absorb everything I’ve learned so far. I keep thinking about what I'm really passionate about and where I find my true motivation. This whole amazing experience with Routes of Yoga has made me think deeply about what I could change in my daily life when I'm back home, so I could have this same feeling of pure happiness and freedom I'm experiencing here in Bali. Your "yoga voice" comes naturally — it is just THERE, you never have to force it. I totally underestimated the power of chanting. Your breath is a very powerful tool. Use it responsibly. Have positive thoughts! They form your values and habits. Nothing helps you understand anything better than experience. There's still sooo much I want to share with you guys about my experience here in Bali! Stay tuned as I dish more tips, stories, and learnings from Week 3 of my yoga teacher training — coming soon!